Ink, tempera, gouache and watercolour on cardboard. Gustave Moreau achieved enormous success at the official Paris Salon where he exhibited between 1852 and 1880. His academic training is evident in the importance of draughtsmanship in his compositions and in his characteristic figures with the their classical, ideal proportions. The enigmatic, mythological subjects that prevail in Moreau’s work are typical of the Symbolist movement of which he is considered the forerunner. Galatea, whom the artist depicted on several occasions, is the principal figure in this work from Moreau’s final years. Her languid figure, reclining in the foreground, is set in a rocky landscape with lush, exotic vegetation. These plant forms are inspired by the marine plants that particularly fascinated Moreau. The cyclops Polyphemus, who has changed colour to match the dark, crepuscular setting, is depicted as a crouching giant observing Galatea from a distance. The brilliant pictorial surface and the richness of the textures derive from Moreau’s innovative method of applying the pigment and from the use of a combination of techniques. 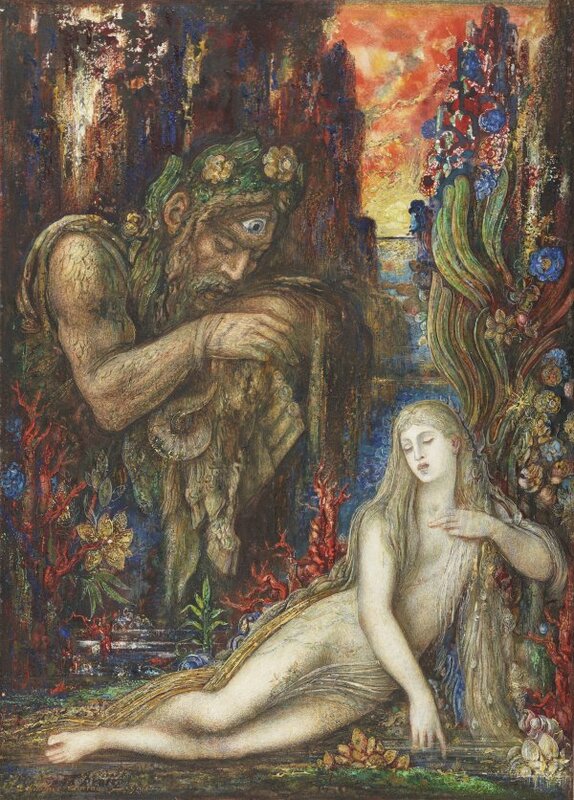 Gustave Moreau painted several versions of Polyphemus and Galathea, one of the Symbolists’ favourite myths, over the course of his artistic career. The scene recreates the theme of beauty and the beast, a symbol of woman as the embodiment of a beauty that is beyond man’s reach. The version belonging to the Museo Thyssen-Bornemisza has been linked to an oil painting shown at the 1880 Salon, though Galathea’s pose is different and the date of execution is later. Moreau, who had a clear preference for mythological themes and for recreating exotic and excessive ambiences, builds a crammed composition of marine flora that set off the naked figure of the Nereid with her long blonde tresses half asleep on a carpet of seaweed, which Geneviève Lacambre has linked to the last pages of Gustave Flaubert’s novel The Temptation of Saint Anthony, of which Moreau owned the 1878 edition. In the catalogue of the collection of Carmen and David Lloyd Kreeger, to whom the work belonged between 1965 and 1977, Charles W. Millard commented that the Galathea in particular was “characterised by the encrusted richness of color and texture that typify his work, making it apparent why Huysmans should have chosen him above all other artists to be admired by des Esseintes in Á Rebours” — or, in other words, that the decadence of the character Duke Jean de Floressas found its closest pictorial equivalent in the painting of Gustave Moreau.